Heaney’s version of a second Rilke poem leaves readers with a double challenge: addressing the complex thinking process of the original poet and considering Heaney’s success as interpreter and translator. For latter comparison an alternative version is appended. Heaney sees a correspondence with his own inner feelings as if conscious of a certain ‘something’ inside himself that he needs to ‘excavate’. Ultimately he digests Rilke’s message! Rilke invites us to observe (watch) changes of light brought on by nightfall in an apple orchard (deepening of green in the evening sward). This has a purpose – he is seeking to give meaning to his feeling (it will be expressed in a long single sentence) that, just as darkness deepens at dusk, and in common with all contemplative spirits (we) he is undergoing the build-up (garnered and stored within ourselves) of an elusive, unspecified awareness (a something). 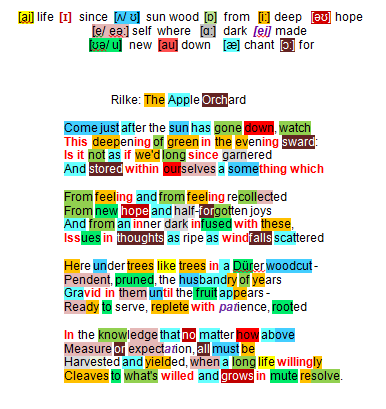 Rilke claims the emotional state is born out of present and past (feeling and from feeling recollected) is reborn in new hope, buoyed by half-forgotten joys and to be found within an inner recess of the ‘self’ (an inner dark infused with these) where the whirl of emotion takes on coherent shape within his psyche (issues in thoughts). The orchard turns metaphor: the liberated thoughts are as abundant and haphazard as apples blown down by the wind (ripe as windfalls scattered here); they reflect the intricacy and detail of trees in a Dürer woodcut. Rilke extends his metaphor –fruiting thoughts are rich and healthy (pendent … gravid) thanks to careful and caring cultivation (pruned, the husbandry of years), emerging in a palatable shape (ready to serve) thanks to time given to maturation (replete with patience). Every process, growth or thought, has a natural cycle – whatever its outcome/ his intellectual presumption (no matter how above measure or expectation) there comes a moment of reckoning (harvested and yielded). Two creative minds converge – the sixty-seven year old Heaney who savours his earthly existence but acknowledges that his days are numbered picks up the Rilke message – who is blessed with long life is prepared for what is pre-ordained (cleaves to what’s willed) and develops the mute resolve to enjoy his apple-orchard of a life. Rilke – deemed Austrian, born in Prague part of the German-speaking district of erstwhile Czechoslovak Prague , so of insecure national identity – was at his most prolific between 1900 –1925. His watch-words are: ‘alienation’, ‘lyricism, ‘mysticism’, ‘spirituality’. The poem is best read and enjoyed in its own right. However, Heaney’s version of a second Rilke poem leaves readers with a double challenge: addressing the complex thinking process of the original poet; considering Heaney’s success as interpreter and translator. To that end an anonymous alternative is appended as a comparison. A second poem in the collection with specific reference to the early twentieth century German-speaking lyric poet born in Prague. This poem contains a touch of mysticism and, as with the nature of much of Rilke’s poetry, requires some teasing out. Heaney weaves the early stages in the poetic process into the text. He is conscious of a certain ‘something’ inside himself that he sets out to ‘excavate’. Subsequently he completes a process and produces the poem we are reading! straining, uncomplaining, by not breaking /but succeeding, even though the burden should / at times seem almost past endurance. /Not to falter! Not to be found wanting! /Thus must it be, when willingly you strive /throughout a long and uncomplaining life, /committed to one goal: to give yourself! /And silently to grow and to bear fruit.